Users who have been using the file hosting service Megaupload to host files on the Internet were in for quite a shock when they received notice that authorities had taken down all company servers and files. For some it meant to upload the files to another file hosting service, others who only had copies of the files on the hosting site realized that they did not have options to get their files back at all because of the take down. The takedown affected all kinds of users, from users who used the service to spread copies of commercial products to users who used it to back up their files. Uploading files to just another hosting provider does not guarantee that the files stay available for a longer time. It should be clear by now that you need to have backups available either locally or in another location to reduce the likelihood that you will lose access to the data completely. A takedown is just one of the possibilities in this regard. A file hosting company may simply shut down business for example or change the business model, or data may be lost due to hacks. Update: The makers behind Megaupload announced a new service called Mega in 2012 and launched the service in 2013. 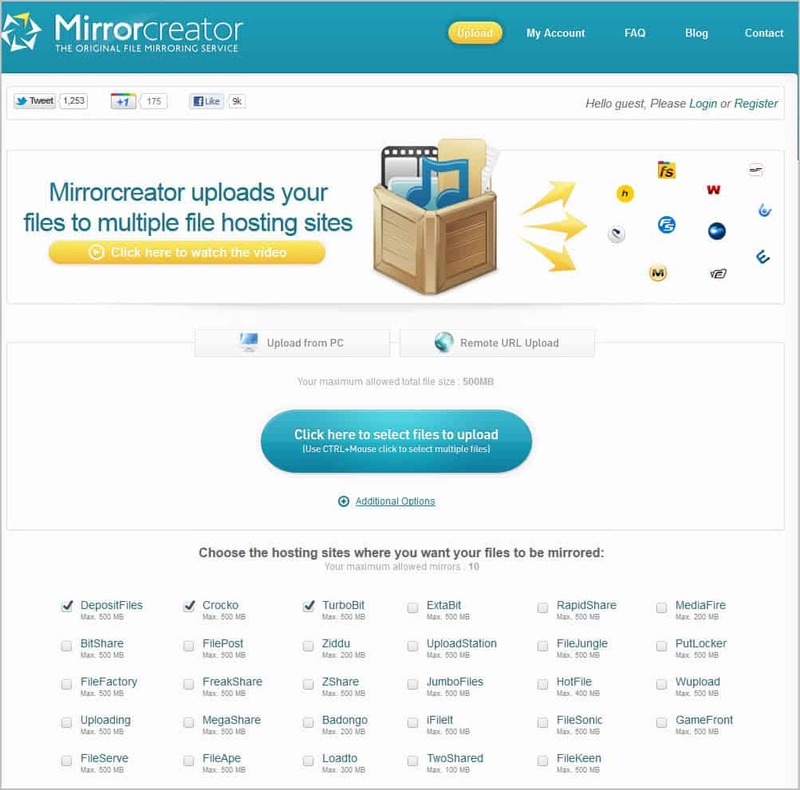 One option that you have is to use so called mirror services such as Mirror Creator to distribute the files to multiple online hosting services. If one or two go down, you still have access to the files on others that you have selected. The process of uploading files to those file hosting services is almost identical to uploading it to one; the main difference is that you need to verify that each file hosting service supports the file size that you want to upload. Select files that you want to upload from your computer. A file limit is always displayed, in the case of MirrorCreator it is 400 Megabytes for free users. Select the file hosting services you want to distribute your files to. Free users can select up to ten services. Start to upload the files once, the mirror creation service will take care of the rest. You may create an account at the site to gain additional benefits such as adding accounts from file hosting services that Mirror Creator supports to the service. Upload On All - Supports 12 services in total of which ten can be selected for distribution. Maximum file size is 300 Megabytes per upload. MultiFileMirror -- Supports more than 30 file hosting companies and a maximum file size of 1024 Megabytes. Upload Magnet -- Supports a total of 15 services and the maximum file size of each of the hosters. Gazup! - Supports six services in total, maximum file size 400 Megabyte if only four are selected. Digzip - Lets you pick eight mirrors from a list of 18. Maximum upload size is 200 Megabytes. Upload Mirrors - Select up to 14 mirror servers where you want your files to be hosted. No information about file size limitations posted on site. You can search for file hosting mirrors and similar phrases to find more services that distribute files for you. Nothing changes for free users who stay below the upload maximum. Users who need to upload larger files have a few options as well. They can split the files using software like 7-zip or Haozip for this. Other services may be offered, for instance the option to delete uploads at a later point in time but that usually requires that you add file hosting accounts to mirror services. If you want to use a specific service, for instance because of the account benefits it provides, you should consider backing up your data at a second cloud hosting service to avoid total data loss if that particular services is no longer available. A suggestion here would be to use a backup and synchronization provider like Dropbox, or if more storage space is required OneDrive from Microsoft or Google Drive. It would means however that you will have to upload the files at least twice for this. You could alternatively back them on a local device if you do not want to waste the bandwidth. Have another suggestion? Lets discuss it in the comments. Find out how to upload your files to the Internet and spread them to multiple services to make sure they remain available if a file hoster goes down. I’ve heard that just about all the well known hosting services are down, or are severely limited. The few that aren’t, will probably be soon. No doubt this will be sorted out in time, but using any of them ATM seems futile. Best to stick with services like Dropbox and (my favourite) SpiderOak for the time being. I agree. Then again, if you need to distribute files to many users you might need to continue using those services, or switch to torrents.